Moving into the historic Exchange National Bank building about a year ago, Vault Coffee sits quietly on a Coeur d' Alene street corner. It's since become a popular hangout spot for many. 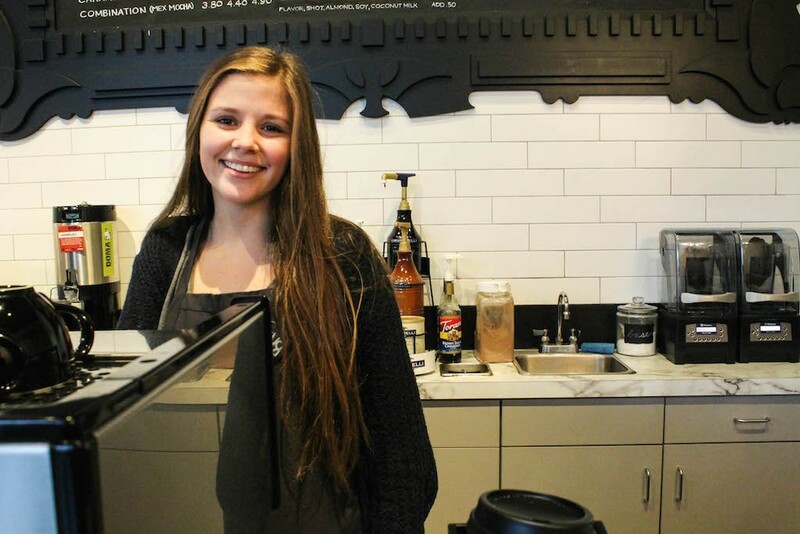 After moving to Coeur d'Alene from California and enrolling in North Idaho College, 18-year-old Brie Slavens traded in her coffee stand job to cash in at Vault. Spending most of her time at work and interacting with some of her favorite people — her customers — you're likely to spot Brie if you make it out to Vault. SLAVENS: I think one of the things I like about coffee is that no matter where you go, it's kind of like a family. You're all interested in the same thing, you're all there for a reason. There's no ulterior motive, either. It's not like you walk into a clothing store and they're like, 'you need to buy this, 'cause this is my paycheck!' Wherever you work in the coffee industry, for the most part you get really close with the people you work with, and I'm a people person, so I need to be with people that I like. How did you end up at Vault? 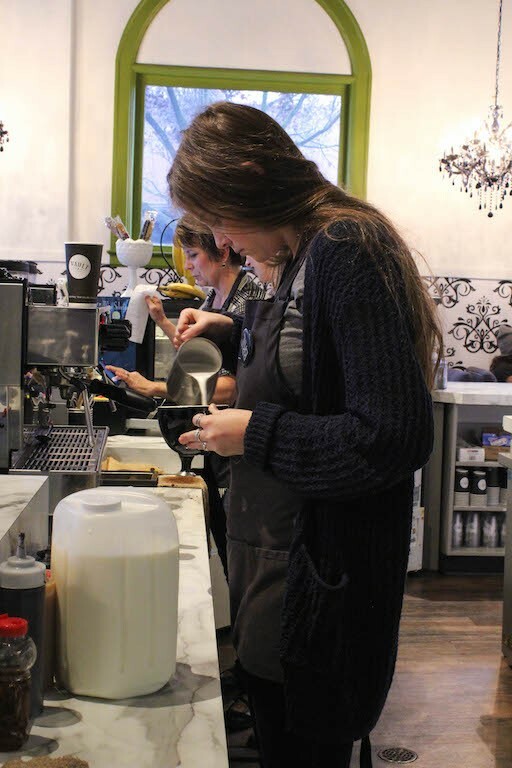 I was dropping of my resume at a couple places —Thomas Hammer and Post Falls Coffee Co., —and both of them called to interview me, but I had already had an interview here. I talked to Danelle, [the owner], and I really liked her right off the bat. She was really kind, and that's the kind of person I wanted to work for. I had an interview with her, and she was just genuine. I want to work for someone who honestly cares about her business and who isn't just in it for a quick income. She cares; she loves all of us. That's why I wanted to work here. Are there any current coffee trends going around that you've noticed? White coffee. That is not coffee. White coffee is such a fad and it's so funny. I think it's gross. Other than the Pumpkin Spice Latte — which is something I'm totally a fan of, I love those, I'll drink those all day, I don't care — I think it just goes with the seasons. I used to ride horses. I totally would if I still have the opportunity. I love horses. Some day, I am determined to have a farm. Not a farm with cows, though, just horses. Probably like two. I like to read. I like to do yoga. I try to do yoga four times a week. Actually, I just changed my major. I was really interested in psychology, but the more I looked into the jobs people pursue with a psychology degree, the less interested I became. Now, I think I'm going to pursue a degree in communications and do something along the lines of own a business, like a coffee shop; something people-oriented but with less science behind it. What's the most rewarding part of working at Vault? Probably two things. One, nailing latte art. It's so awesome, because the more you learn and the more you practice, you realize that it's not the easiest thing in the world. Getting a beautiful drink out to somebody and having them be like, 'Wow, that's amazing,' or see them take a picture of it, it's so awesome. And then, just like personal relationships with customers. Getting to know them and having their drink ready for them — all that stuff makes their day a little easier. Plus, being a family is bomb. I do enjoy that. Could you share a favorite memory you've had here? After you make an espresso, the coffee bean left in the filter makes like a "puck." [My coworkers] put it on a plate and put whipped cream and caramel on it, and they were like, 'Try this! It's a dense brownie!' And I was like, 'Oh, yeah! That looks so good!' So I tried it and I didn't even know. I didn't even spit it out, it wasn't even horrible — like, most people threw it up and I was like, 'Whoa, this is interesting...' They were both laughing on the ground. So, that was my initiation. What's your favorite thing to drink here? It's really boring, but I really like almond milk vanilla lattes. I love almond milk. It's just like love in a cup. What's your favorite food item here? Oh, my god, I love the quiche. It's so stupid, I love the quiche. I have one like every day, and it's so bad, because no one should eat quiche every day, but it's so yummy. If you could describe Vault in one word, what would it be?